Research and the Teaching Profession: Building the Capacity for a Self-Improving Education System concludes that teachers across the UK should be supported to become research literate. This should include being given frequent opportunities to read up on the latest findings, with every pupil entitled to lessons which are informed by the best evidence. The inquiry lays down 10 principles for self-improving and research-rich education systems, and 20 recommendations, embracing both teacher education and teachers’ professional development once in the job. The final report of the BERA-RSA inquiry into Research and teacher education concludes that the UK “lacks a coherent plan for teacher research and development”. The report goes on to say that teachers’ experience of professional development in most parts of the UK is “fragmented, occasional and insufficiently informed by research”, in contrast to that of internationally well-regarded education systems such as Finland, Canada and Singapore. In Scotland, “it is now government policy to develop a systematic and coherent approach to [research-informed] career long professional learning”, with universities given a prominent role, following the Donaldson review for the Scottish government. However, across the rest of the UK there is a more fragmented and piecemeal approach to the use of research than that displayed by high-performing systems such as Finland and Canada. There were some examples of good practice in England, such as the London Challenge initiative, which ran from 2003 to 2011, which had seen schools work together to share improvement strategies. But there is no “co-ordinated strategy” to replicate its success across England. The report acknowledged that pressures, including time pressures, facing teachers made this agenda challenging, but called for a cultural shift so that, over time, engaging in and with research becomes an everyday part of teachers’ jobs. This final report marks the end of an 18-month Inquiry run jointly by BERA and the Royal Society for the Encouragement of the Arts, Manufacturing and Commerce (RSA) looking at the contribution research can make to improve the quality teaching. The Interim Report of the Inquiry along with all the background papers can be downloaded from this page along with an easy e-reader version. 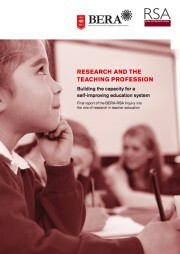 BERA Paper 6 Teacher Quality and School Improvement: What is the Role of Research?